Not exactly a fun day to be walking around at lunchtime but nevertheless John gamely came down to meet us. In the interest of the rain, the chill and the gray skies we were looking for something uplifting and delicious. Kimchi to the rescue! Kimchi never fails to bring a contented Cheshire grin to our faces. 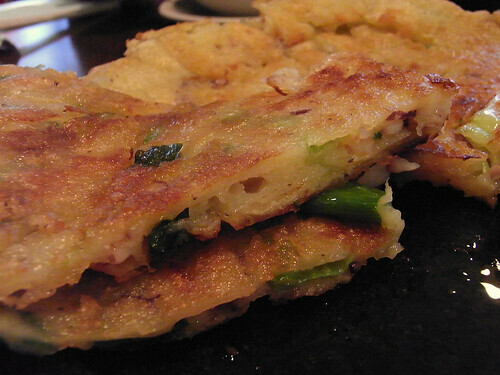 And with a hearty stomach aka John to share in the meal, we could order the seafood pajeon without fear of overstuffing. So we needed some hearty fare to tie us o'er. Gave my step back it's hop.